Born at Ravenna, probably about 950; died at Val-di-Castro, 19 June, 1027. St. Peter Damian, his first biographer, and almost all the Camaldolese writers assert that St. Romuald's age at his death was one hundred and twenty, and that therefore he was born about 907. This is disputed by most modern writers. Such a date not only results in a series of improbabilities with regard to events in the saint's life, but is also irreconcilable with known dates, and probably was determined from some mistaken inference by St. Peter Damian. In his youth Romuald indulged in the usual thoughtless and even vicious life of the tenth-century noble, yet felt greatly drawn to the eremetical life. At the age of twenty, struck with horror because his father had killed an enemy in a duel, he fled to the Abbey of San Apollinare-in-Classe and after some hesitation entered religion. San Apollinare had recently been reformed by St. Maieul of Cluny, but still was not strict enough in its observance to satisfy Romuald. His injudicious correction of the less zealous aroused such enmity against him that he applied for, and was readily granted, permission to retire to Venice, where he placed himself under the direction of a hermit named Marinus and lived a life of extraordinary severity. About 978, Pietro Orseolo I, Doge of Venice, who had obtained his office by acquiescence in the murder of his predecessor, began to suffer remorse for his crime. On the advice of Guarinus, Abbot of San Miguel-de-Cuxa, in Catalonia, and of Marinus and Romuald, he abandoned his office and relations, and fled to Cuxa, where he took the habit of St. Benedict, while Romuald and Marinus erected a hermitage close to the monastery. For five years the saint lived a life of great austerity, gathering round him a band of disciples. Then, hearing that his father, Sergius, who had become a monk, was tormented with doubts as to his vocation, he returned in haste to Italy, subjected Sergius to severe discipline, and so resolved his doubts. 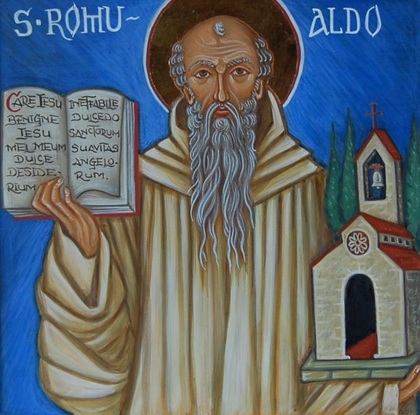 For the next thirty years St. Romuald seems to have wandered about Italy, founding many monasteries and hermitages. For some time he made Pereum his favourite resting place. In 1005 he went to Val-di- Castro for about two years, and left it, prophesying that he would return to die there alone and unaided. Again he wandered about Italy; then attempted to go to Hungary, but was prevented by persistent illness. In 1012 he appeared at Vallombrosa, whence he moved into the Diocese of Arezzo. Here, according to the legend, a certain Maldolus, who had seen a vision of monks in white garments ascending into Heaven, gave him some land, afterwards known as the Campus Maldoli, or Camaldoli. St. Romuald built on this land five cells for hermits, which, with the monastery at Fontebuono, built two years later, became the famous mother-house of the Camaldolese Order. In 1013 he retired to Monte-Sitria. In 1021 he went to Bifolco. Five years later he returned to Val-di-Castro where he died, as he had prophesied, alone in his cell. Many miracles were wrought at his tomb, over which an altar was allowed to be erected in 1032. In 1466 his body was found \still incorrupt; it was translated to Fabriano in 1481. In 1595 Clement VIII fixed his feast on 7 Feb., the day of the translation of his relics, and extended its celebration to the whole Church. He is represented in art pointing to a ladder on which are monks ascending to Heaven.